I’m minding my own business and McAfee wants to “Update”. I think this is a simple update of the virus database and even though I am very busy doing something else, I go for the update. So of course, without warning, I am treated to a monster update of the entire McAfee program, complete with all kinds of FUD links that lead to very poorly executed landing pages. Terrible customer experience, and that’s what I was going to post about. But since everybody probably sees the same thing all the time, I think the following sequence will be much more interesting. 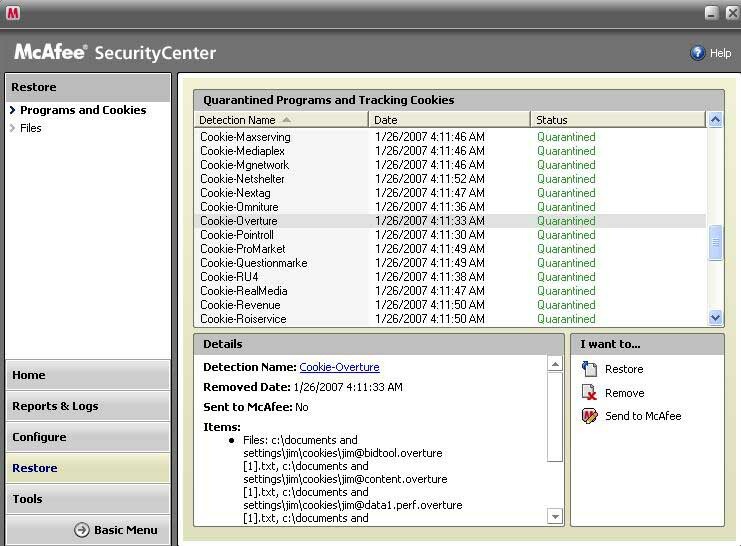 All my “tracking cookies” have been Quarantined. Certainly looks like all the major ad-serving networks are represented, and what looks to be a bunch of Overture conversion cookies. This cookie crunching doesn’t mean much to me because I don’t build any very important (KPI level) metrics using “Unique Visitors” as a base. For one thing, I was doing web analytics before cookies were pervasive and I’m comfortable using “Visits” or “Sessions” as a base (Sales per Visit, for example, as opposed to Sales per Unique Visitor). The other reason is that you simply cannot get an accurate Unique Visitor count, meaning there’s a lot of “noise” in the number. I don’t like basing key performance metrics on a noisy base number, it’s asking for trouble. And it appears this cookie situation will be getting worse over time – worse than it already is with all the anti-spyware scrubbing of cookies, the firewall problems, and so forth. Yet I know a lot of people base everything they do on Unique Visitors because it “makes more sense to management” and it’s “more logical” and so forth. Fine. Here’s what is going to happen. The cookie block / erase / quarantine problem is going to artificially increase the number of Unique Visitors you are getting to the site. You’re not getting more, it will just look like you are due to loss of tracking at the Unique level. This means Sales per Unique Visitor, for example, will start falling over time even though in reality, based on actual Unique Visitors (which you can’t measure) it may be staying the same or rising. Makes more sense to management, indeed. Until you try to explain why Management should now believe your Visit-based metrics instead of the Unique Visitor based metrics. Good luck on that one. I think there is one fundamental concept most people are failing to understand: tools like McAfee look for 3rd party cookies served by very specific ad networks or, in our case, web analytics solutions. This leads to a simple fact: don’t use 3rd party cookies when you implement web analytics, use 1st party cookie at all cost! This is easy to implement and will significantly lower the noise at the base level. But still, the fact remains that FUD puts all kind of cookies in the same basket, even those that are use for very useful and specific purposes. In the end, the arguments against unique visitors tracking are piling up… visits, pages and now, events, are more interesting than ever! Thanks for the comments! Stephanie, I get the difference between 1st and 3rd party cookies as it applies to the pure site analytics world but there are lots of other cookie problems that make Unique Visitors an inaccurate base for KPI’s. What I really wonder about is all these highly touted studies in the display ad world like “view through” and ideas like Frequency caps. How can any of that be real or working properly if all these cookies are being demolished? The idea that mere exposure to a display ad leads to site visits even if there are no clicks can’t really be measured, can it? Ron, you’re just being Cranky, I know…but I actually dumped McAfee for Zone Alarm Anti-Virus shortly after this screwed up experience. McAfee has just pissed me off too many times with poor execution and user experience. When I say I want to manage the update process, I want to manage it – all of it. Those companies in commodity businesses who fail to understand it’s about the service / process not the product are headed for some hurt. I don’t like McAffee either. I have it work because it is what the company uses-at home I have sophos. I don’t really care about unique visitors, the major metric that matters for us on the web site is leads (a potential prospect that raises their hand by filling out one of our registration forms). I look at entry pages, exit pages, paths, where users are coming from and I study our logs for any new keyword phrases that could crop up, but not much more after that. Of course, we measure landing pages, test them, etc. to improve our form conversion rates but certainly not unique visitors. Pingback: Web Analytics Demystified » Blog Archive » Playing catch up again after a family outing to SeaWorld!